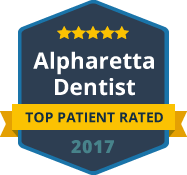 Crabapple Dental provides high quality reconstructive dentistry to the residents of Alpharetta and the surrounding areas. We are a comprehensive dental practice consisting of an experience dentist, Dr. Sarah Roberts, and a committed team of dental support staff. Our passion is creating the smile you were meant to have, one that is attractive, confident, and beautiful! Our practice provides a full range of reconstructive dental care including fillings, extractions, root canals, crowns and bridges. We also offer treatments for periodontal disease as well as the placement and restoration of dental implants. Dr. Sarah Roberts is highly trained and experienced in providing all different types of reconstructive dental care. Using the latest technology, state-of-the-art instruments and high quality materials, we are able to restore both the form and function of patients’ smiles. Conveniently located in downtown Crabapple, Crabapple Dental provides restorative dental care as well a full range of preventative, general and cosmetic dental services. Our dentist and staff work hard to provide a high level of dental care delivered in a warm and caring environment. Whether you come into our practice for a simple restorative procedure such as a filling or a full mouth restoration, you will be treated with the utmost respect and consideration. If you have a fear of the dentist or if you have failed to seek needed dental care in the past due to fear or anxiety, we can help. Our practice offers local anesthesia as well as sedation dentistry to keep patients relaxed, comfortable and free of pain during dental procedures. 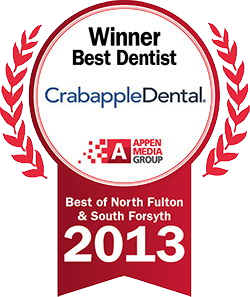 For expert teeth restoration, contact our Alpharetta Reconstructive Dentistry Specialists at Crabapple Dental today. We are currently accepting new patients and we would welcome the opportunity to serve you or a member of your family. If you have dental insurance, we are happy to file dental insurance claims on your behalf. We look forward to helping you achieve an attractive, confident, beautiful smile!